Are you as fixated on the first season of The Fix TV show on ABC as Maya Travis is on Sevvy Johnson? As we all know, the Nielsen ratings typically play a big role in determining whether a TV show like The Fix is cancelled or renewed for season two. Unfortunately, most of us do not live in Nielsen households. Because many viewers feel frustration when their viewing habits and opinions aren’t considered, we’d like to offer you the chance to rate all of The Fix season one episodes here. 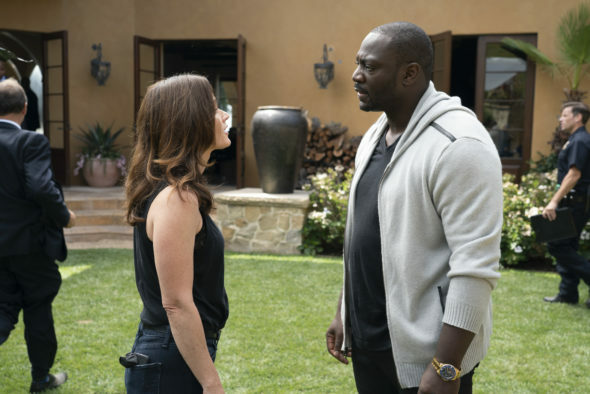 An ABC legal anthology drama, The Fix stars Robin Tunney, Adewale Akinnuoye-Agbaje, Scott Cohen, Adam Rayner, Merrin Dungey, Breckin Meyer, Marc Blucas, Mouzam Makkar, and Alex Saxon. The first season centers on former prosecutor, Maya Travis (Tunney) who, in 2010, was unable to convict movie star Sevvy Johnson (Akinnuoye-Agbaje) in the double-homicide of his wife and her friend. After the trial, Maya left LA, but now that Sevvy’s girlfriend has been killed, she’s lured back into action, for a second shot at justice. What do you think? Which season one episodes of The Fix TV series do you rate as wonderful, terrible, or somewhere between? Should ABC cancel or renew The Fix for a second season? Don’t forget to vote, and share your thoughts, below. More about: The Fix, The Fix: canceled or renewed? The Fix keeps you on the edge of your seat and has some great twists and turns. It’s my favorite new show. The show was OK, but it keeps reminding me of OJ Simpson and I think Marcia could have done better than this. The lead character seems contrived. Meanwhile I will keep watching it until I get bored with it. Not the best series I’ve seen as yet.